This Italianate house on Cape Cod, originally built in 1864, gets a new lease on life. In Old House Journal, writer Regina Cole captures the historic beauty restored by Polhemus Savery DaSilva Architects Builders (PSD). Our team at Classic Kitchens & Interiors worked with PSD on the kitchen. When the homeowner purchased the home, the kitchen was utilitarian, with its design focused on serving breakfast to inn guests. The kitchen was redesigned to fit the needs of the family. 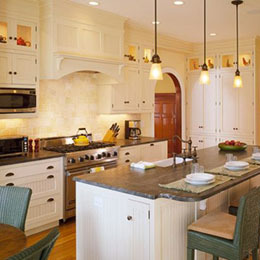 Beadboard cabinetry and stone countertops were used to refresh the kitchen, while also keeping in character with the rest of the home.